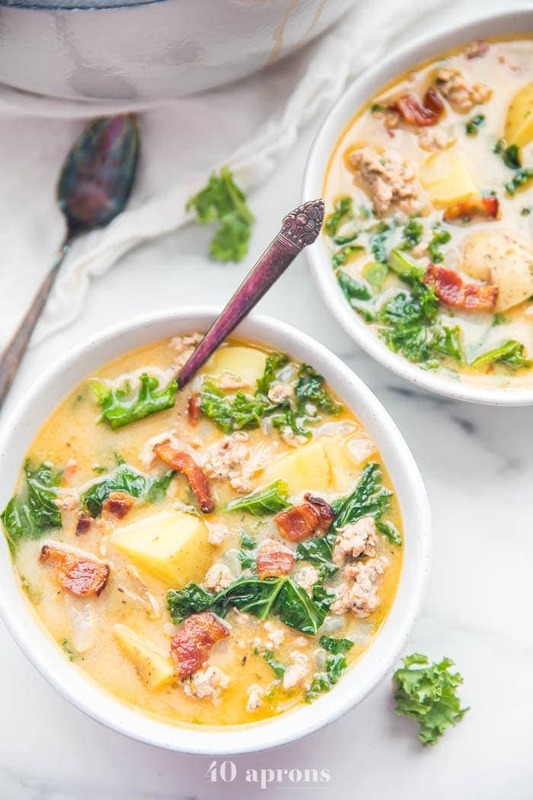 This Whole30 healthy Zuppa Toscana is rich and creamy, spicy, and absolutely bursting with flavor. You’ll love this filling, Whole30 soup anytime, but especially during cold, wintry months. Dairy free, gluten free, grain free, and sugar-free, this is one of the best Whole30 soups out there and my favorite healthy soup! We started a recent Whole30 with this soup, and I have to say: we did it right. I even posted a snap (?) on Instagram, lamenting how oh. so. hard. it is to do a Whole30, with lots of crying emojis… I’m subtle. In previous rounds, I tired quickly of large slabs of animal protein, so I knew I had to shake things up a bit this round. And leading a group Whole30 and Facebook support group (join us!) means coming up with new and delish recipes to keep things interesting. Et voilà, my friends, the Whole30 Zuppa Toscana. 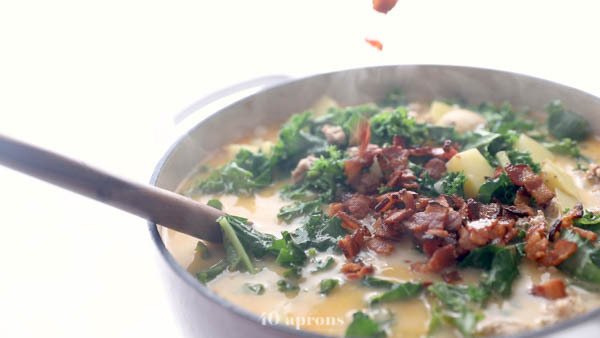 Who isn’t a fan of the creamy, spicy soup at your favorite Italian-food chain, laden with potatoes and kale and bacon and Italian sausage and “ohhhh boy”. Especially during the winter, my cravings for creamy, filling soups multiply like four-hundredfold, so we find ourselves in a tricky spot. 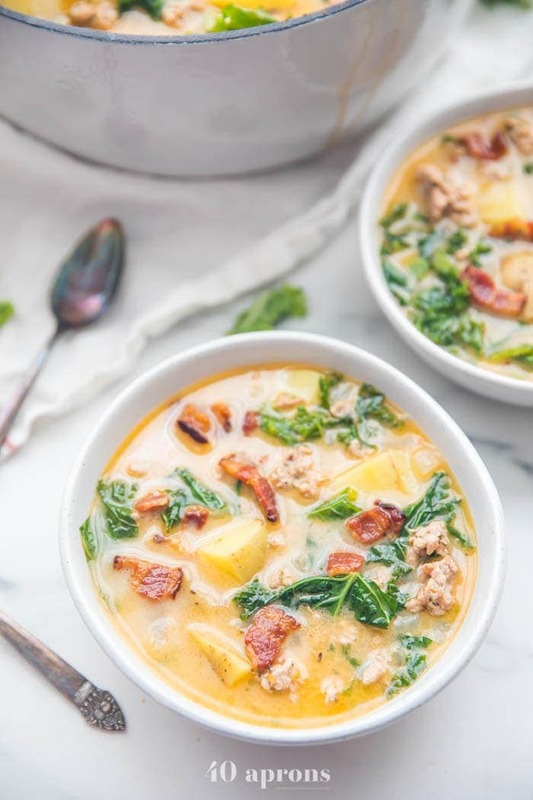 A spot where you’re 100% committed to doing a strict Whole30, but you really, really want Zuppa Toscana. 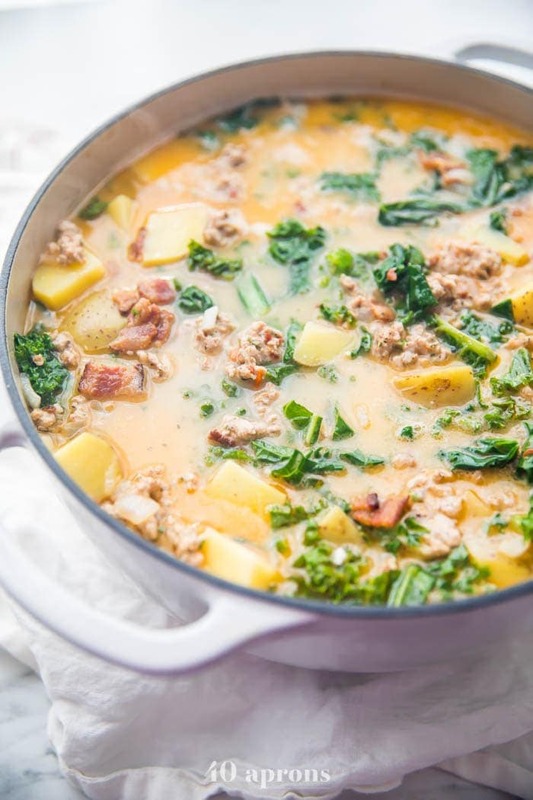 This Whole30 soup is rich and creamy like traditional Zuppa Toscana but totally dairy free. It starts with an easy but delicious Italian sausage recipe, made from scratch! But don’t be nervous – it’s super quick and couldn’t be simpler. 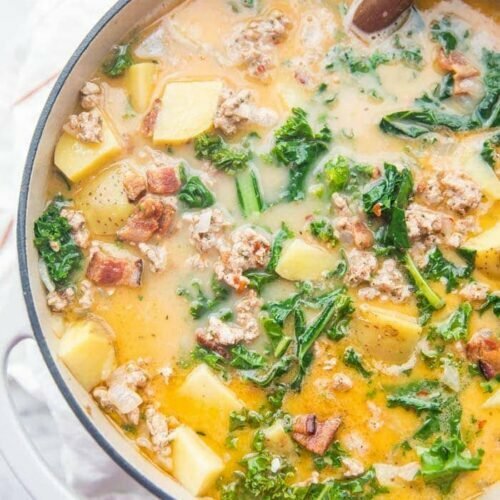 The combination of coconut milk, kale, potatoes, Italian sausage, and bacon make this healthy Zuppa Toscana super filling and a one-pot meal. 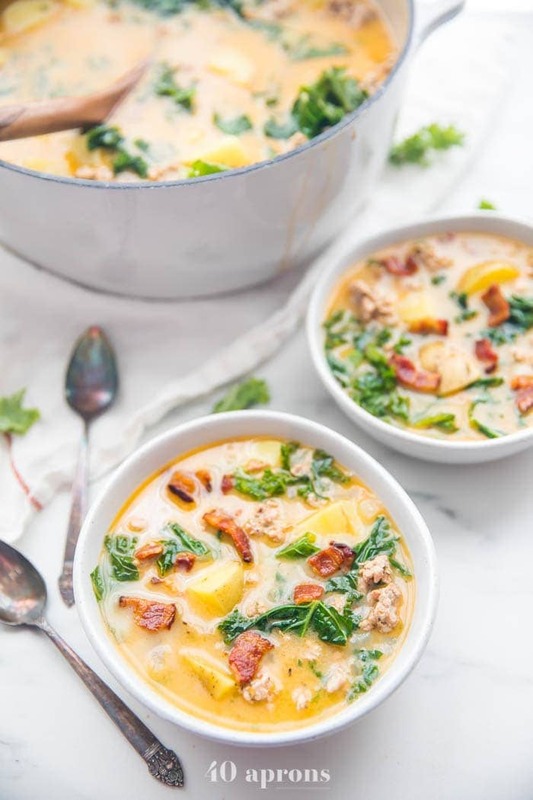 This Whole30 Zuppa Toscana is based on a regular Zuppa Toscana recipe, subbing simple ingredients for the dairy, grains, and sugar. I recommend making your own Italian sausage, which is insanely easy, but you could use compliant storebought Italian sausage, too, of course. Make sure you use compliant bacon if you’re on a Whole30, as well. It can be tricky to find bacon that doesn’t have sugar in it, but Whole Foods has a few brands of that, as well. I have a tendency to be super hungry on the Whole30, like eat. all. the. things., but this soup kept me super full all night. I might have had to bite my knuckles to get past my craving for Glutino pretzels on tap, shoveled into my face during our nightly screenings of Boardwalk Empire, but it wasn’t from hunger, that’s for us. That, my friends, is a habit that, I have to say, I kind of still miss. Baby steps, fam. Baby steps. If you avoid potatoes, try cauliflower florets in place of the diced potatoes. You can even try celery root! 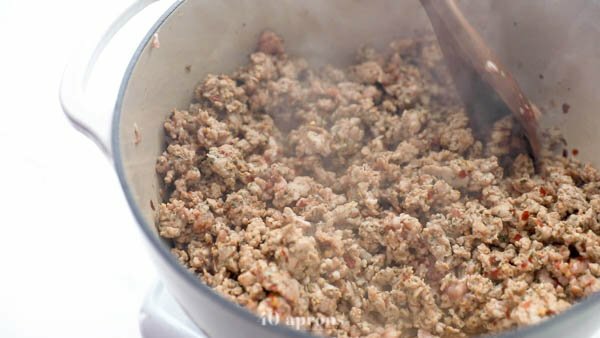 Try ground chicken in place of the pork, if you prefer or don’t eat pork. If you’re allergic to coconut or are worried it might have a “coconutty” flavor, swap the coconut milk out for cashew cream. Combine 1 cup raw cashews with 3/4 cup water in a high-speed blender and blend until completely smooth. Don’t overcook the soup after you’ve added the kale. You want it bright green and just wilted. 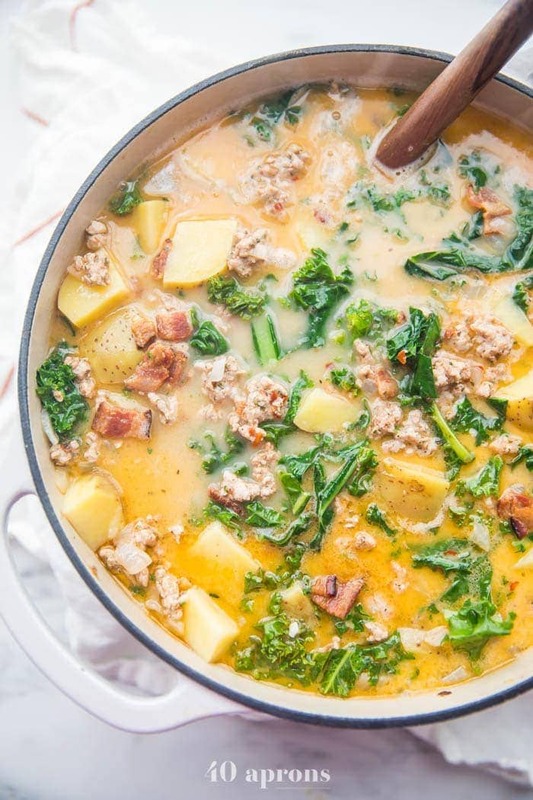 Make a big batch of this Whole30 healthy Zuppa Toscana on Sunday and eat it all week. Comfiest meal prep ever! Leave out the extra 1/2 teaspoon crushed red pepper flakes in the soup if you’re sensitive to heat. Make your Italian sausage: combine all ingredients and mix well with your hands. Alternately, simply pour all ingredients into a large pot and mix with a spoon while browning. Brown the sausage in a large heavy-bottomed pot, preferably a Dutch oven, breaking up with a spoon or spatula. Remove from pot, drain, and set aside. 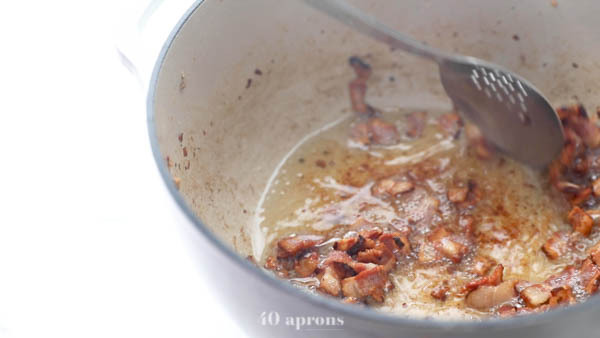 Fry bacon until crisp and remove with a slotted spoon. Don’t get rid of bacon grease! Stir in the onions and garlic and cook until soft and translucent. Add chicken broth and bring to a boil. Add the potatoes and boil about 10-15 minutes, or until potatoes are fork-tender. Reduce the heat to medium and add coconut milk and sausage; stir until smooth. Add in kale and bacon and cook until kale is bright green and just wilted. If making Italian sausage: combine all ingredients in a bowl and mix well. Alternately, combine all ingredients in the saucepan and stir well when browning. This recipe was originally published in January 2017 but was updated with step-by-step photos, video, and tips August 2018. Thank you, thank you for this AMAZING Zuppa ! This was a huge HIT in our house we will make this again and again for sure!! The spices mix is Amazing you can taste the of fennel tree out the soup! It was great to look at, to smell, and also to eat! If fenouil isn’t s spice you cook with you will fall in love with in this recipe! Thank you again ! This is my go to zuppa recipe. It tastes amazing and is so much cleaner and healthier than the other kind i used to make before. On top of that my hubby loves it too. I also sub the potato with one head of cauliflower and it works out perfectly. That’s such an interesting variation! I’m so happy you guys love it as much as I do. I ate this at my son’s house and my daughter-in-law is Erin Harms who posted her comments earlier. I asked her for the recipe. I LOVED it!!!! Very tasty, satisfying and with the addition of the kale, certainly makes for a healthy meal at that. The coconut milk gives it a rich taste that sets it apart from normal everyday soups. I’ll be making this very soon!!!!!! This soup is DELICIOUS!!! I made this for a friend who is recovering from surgery and I had to try it myself. It does not dissappoint!! Thank you for the recipe! Superb recipe. I have to admit I am a tweaker with any recipe to suit family tastes. That being said, fabulous and I hardly miss the crusty bread and sprinkle of Parmesan cheese. ok, So I am not one to post comments on anything. BUT this is the best soup I have ever had! It is saving my life on whole30 right now. I have made it with bacon and with out, and I don’t miss it when its not there, so I will continue to omit due to cost of compliant bacon. So creamy and hits the spot! I have been having it for breakfast! This makes me so happy to hear!! I am so so glad you love it so much! Delicious flavorful meal for my husband and me. Thank you for sharing – esp the sausage recipe. I will be making this again! Delicious meal and super flavorful. Thanks for the sausage recipe – I will make this again for other meals. This is a 5-star review from my husband and me. This is delicious. I’ve made it enough that we don’t even need a recipe. I frequently leave out the bacon, as we usually don’t have leftovers and I don’t find that it adds much in this already flavorful soup. And I serve the pepper flakes on the side – apparently they are spicy if you are a kid. My daughter would love me to skip the kale, but she eats the rest of this soup, and that’s saying something! Can I now request my sons favorite soup – minestrone – for a makeover paleo-style? This soup was excellent! My family of 5 all loved it. I will definitely be making it again. This was Soooo good!!! Thank you so much for sharing! My whole family liked it which is a BIG deal! Thank you!!! Made this is weekend…it was quite tasty! Thanks! This recipe is a crowd pleaser in my house! It is my husband’s absolute favorite. We have had it on the regular rotation since we committed to a cleaner diet last winter. You have opened my eyes to using coconut milk in recipes, and I am so grateful! Thank you for posting this tasty and delicious recipe! This is hands down the best soup ever! I am allergic to garlic, so I exclude it from the recipe and it is still amazing! We rarely make a recipe more than once, and we have made this many, many times over the last year. Wow, this was surprisingly delicious. I never cook with coconut milk so I was skeptical. Even my husband liked it. I look forward to cooking more of your recipes! This is my favorite whole30 recipe of all time. DELICIOUS! And it freezes well too!! Thanks! I’m not the biggest soup maker, but daaaaaaaamn was this the best I’ve ever made…it tastes a bit different than the Olive Garden variety, but I’d have to say it’s better. I left everything the same as the recipe but added extra kale and more broth since it didn’t seem to have enough once I combined everything. This is the 2nd time making this in 3 weeks. Best soup i’ve ever made and the husband loves it as well! Even the kids! I recently changed to a Paleo lifestyle and have been on the hunt for recipes that could become staples in our kitchen. I made the Healthy Zuppa Toscana recipe this week and it was better than I even hoped it would be! It left my kitchen with this amazing aroma and a meal that I could wait to eat the next day as leftovers. This dish is so flavorful – my husband loved it as well even though he is skeptical of Paleo recipes 🙂 Thanks for the awesome recipe. I am excited to check out the others! Can you do this recipe in an instapot and is it really one pound Italian sausage and one pound pork? I made this soup last night and my boyfriend swears that not only is it the best soup he’s ever eaten, but that it’s the best meal I’ve ever made! And I cook a LOT. So yea, thanks for the amazing recipe! I will be making it again. Not that you need any more comments but man…another home run!!! We can’t get enough of this. This will be a staple in our house now. Loving your recipes and website. My new favourite! Thank you! Question on your Zuppa Toscana…it says it serves 4…do you know how many ounces each serving is or total ounces made for the recipe? I’d like to make a 6-8qt crockpot full to bring to an event but wasn’t sure how many times to multiply the recipe. Thanks so much!! I would say each bowl is about 14-16 ounces? I honestly don’t know exactly but that seems like a solid guess at serving ounces.